Quest for Inter-City train: Yesterday I took a look at the 1980 LEGO Trains upgrades for trains, the versatile motor and lighting options that were available. Where the 1980 released LEGO Trains system really shines, though, is its track system – no other LEGO Trains before or after can match its scope, the nearest comparable thing are probably the likes of miniature Märklin trains (also the 1969 LEGO Trains got pretty close). For some background and to see the 1980s 12V LEGO Trains in action, check out So what’s next?, Trains commercial and Trains commercial II posts. Back in the 1990s LEGO had a 9V Trains system, that powered the trains directly from the partially metallic 9V tracks, which has made it quite popular amongst LEGO Trains enthusiasts. 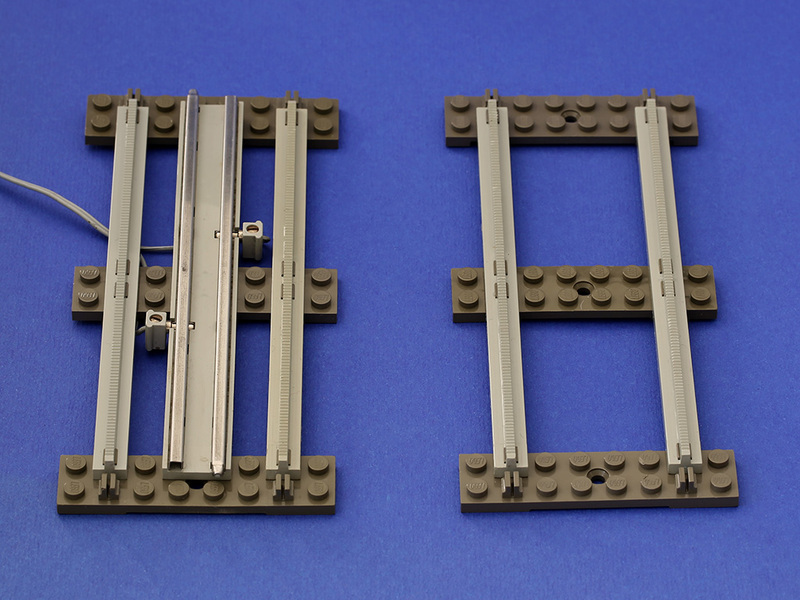 Other than that, though, all LEGO Trains tracks – from the oldest 1960s, 1970s blue tracks to the latest tracks shipping today – have been plastic for push-along/battery powered use. This was true for the 1980 LEGO Trains as well, which meant the same tracks were used by powered and non-powered trains. 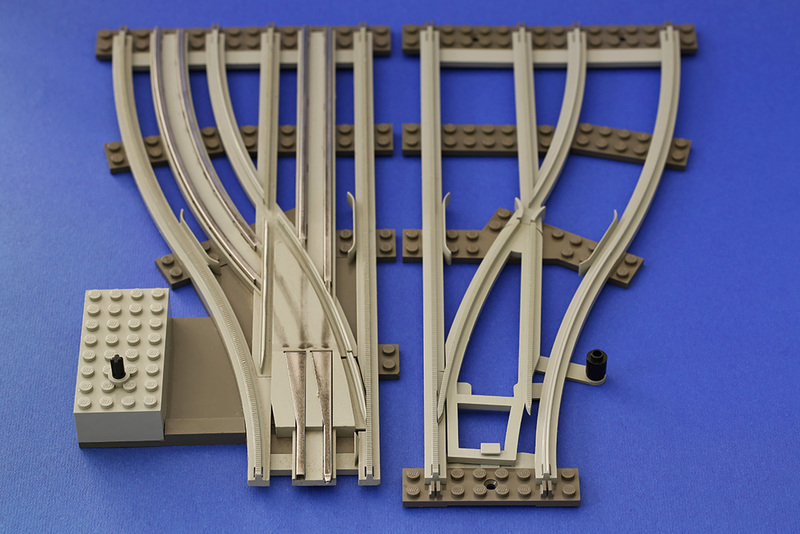 The regular tracks could be upgraded to operate 12V mains powered trains by adding straight or curved 12V train track power inserts (aside from few special parts like points/switches, where you had to buy push-along/battery or 12V version separately). Above: 12V powered tracks on the left (including the cabling to the transformer), the same tracks without the power insert on the right for push-along/4.5V battery use. Above: A 12V remote control attached to the left side of the transformer. A virtually unlimited number of 12V remote control units could be daisy chained on the left side of the 12V Transformer, which powered them. Depending on the wiring setup, these remote controls could then be used to control (basically switch on/off) a number of different LEGO Trains components: 7858 Remote Controlled Points Right 12 V, 7859 Remote Controlled Points Left 12 V, 7860 Remote Controlled Signal 12 V, 7862 Remote Controlled Decoupling and Signal 12 V, 7866 Remote Controlled Road Crossing 12 V, 7867 4 Lighting Standards Electric 12 V. Different types of remote controls had different labels printed on them and some had special features attached to them, such as the blinking module in the 7866 Remote Controlled Road Crossing 12 V.
Above: During my Quest for Inter-City train I am not planning to build a 12V track system, but I have gathered some parts to try out the train. On the right is one of my childhood push-along/4.5V battery 7852 Left and Right Points Manual Grey 4.5 V points compared to one of BrickLink acquired, 12V powered 7856 Left and Right Manual Points with Electric Rails Grey points. As you can see, in addition to remote controlled 12V points, there was also a manual 12V version that looks the same but can’t be remote controlled. There were a lot of options back then. To connect to the 12V Transformer, the train track power inserts and one of the 12V light bricks I have, you need the leftmost cable with the small, separate single plugs. The larger dual connector won’t fit. On the other hand, my 12V train motor and another one of the 12V light bricks accepts either cable. Peeron, for example, shows the separate single plugs in the 7740 Inter-City Passenger Train building instructions scans, but lists the dual plugs in the parts inventory instead. These are probably generational or market-to-market differences designed to avoid mixing 4.5V and 12V components. If anyone has the nitty gritty, please chime in on the comments. 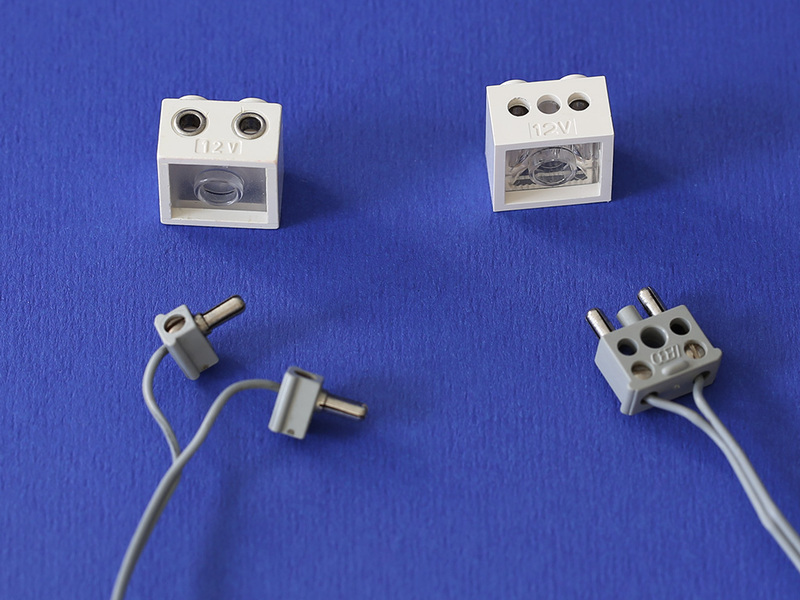 Both cable types allow daisy chaining, the smaller plugs to their rear side, the larger dual plugs on top/bottom. 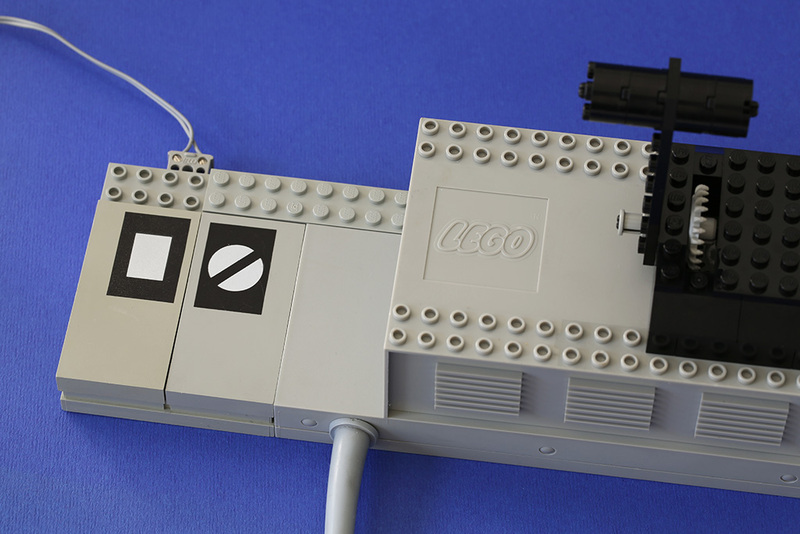 This is used, for example, to connect both front and rear lights to the 12V train motor on the 7740 Inter-City Passenger Train, but you can also use it to connect various LEGO Trains systems to each other and control them collectively.